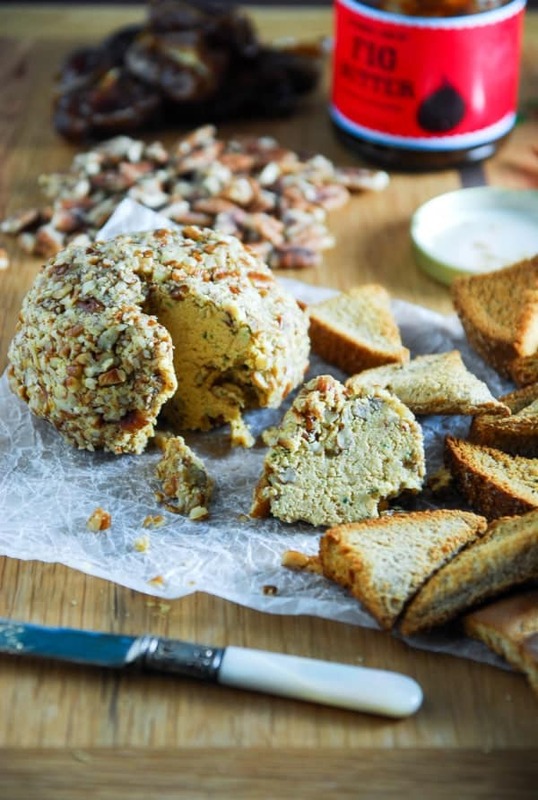 This Smoked Paprika and Cheddar Vegan Cheese Ball requires less than 10 minutes of hands on prep work and is perfect for holiday parties! There are four recipes that remind me distinctly of my late Grandma Millie: chicken and noodles, custard pie, Swedish coffee cake, and this cheese ball. I was actually never a fan of the custard pie (too jiggly and weird texture for me), but loved every single one of the other recipes. Her chicken and noodles were a Sunday tradition in our house, and since she would send us home with huge tubs full of them already prepared we could eat on those for ages. The pie I obviously stayed away from, but the cheese ball I was always all over come Christmas time. My mom has continued on in making the cheese ball each and every year since it’s tradition, along with our usual lasagna on Christmas Eve. (Does anyone else eat unique things on Christmas?). My grandmother never actually called it a specific name and I think when I found the recipe card in her recipe box it was just called ‘cheese ball.’ So descriptive, right? I think there are probably five or six recipes in there labeled just ‘Cookies,’ so I’m going to have to think on titles for those when I get to vegan-izing them. As grandmas do, the measurements for the cheese ball were vague at best, simply because she and my mom probably know the measurements just out of habit rather than from looking at a piece of paper. I knew when I set out to vegan-ize this favorite holiday treat that I needed to keep the main components of it intact. The flavors I remember most about this cheese ball are onion, garlic, and pecans, among the cheesy flavors, of course. The original cheese ball recipe actually calls for ‘onion juice,’ but since I know most people don’t have that laying around (I certainly didn’t), I opted for using red onion instead. Cashews are always a solid choice for a cheesy vegan base, along with a few spices, garlic and pecans, of course. I hope you enjoy this vegan cheese ball as much as I always have. I think this version is going to become a regular in my vegan cheese rotation now! Happy last weekend before Christmas! Whether you’re making a vegan cheese ball or a regular one, you make them both in the same way. 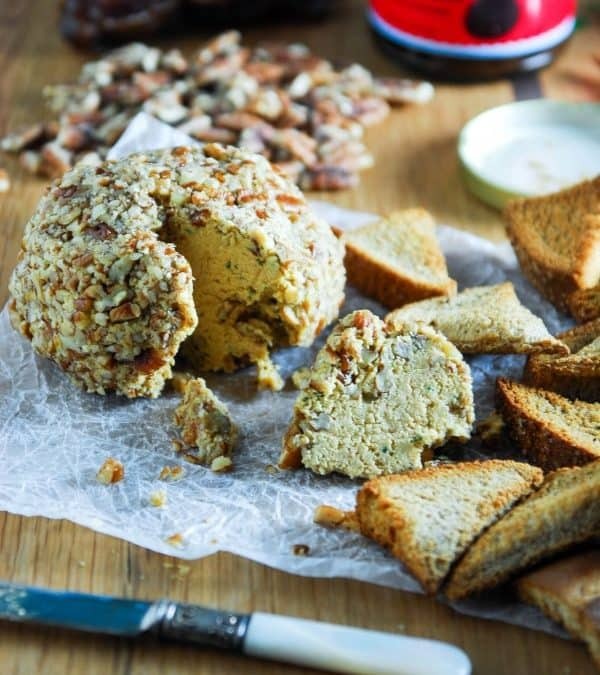 To make this savory vegan cheese ball recipe, you’ll need to plan ahead a little because the cashews need to be soaked for at least four hours (but overnight is better!). Once the cashews have soaked, you simply have to add all the ingredients into a high powdered blender and blend everything together until smooth. Keep in mind that you might have to add a little more water to help this vegan cheese ball reach the right consistency. You don’t want the mixture too be too runny though, otherwise you can’t form balls out of it! 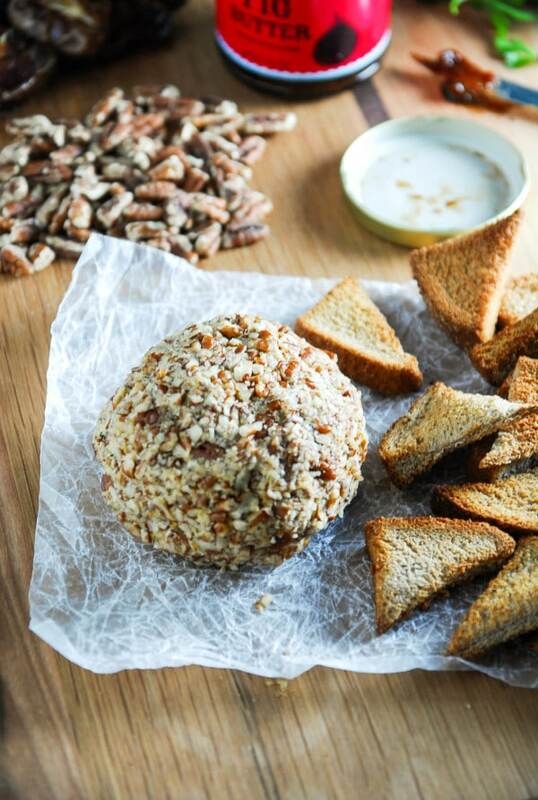 This vegan cheese ball recipe actually makes two medium-sized cheese balls. Once you’ve made the cheese ball mixture in the blender, form it into the two balls and roll each in the chopped pecans. Then, wrap them in plastic wrap and pop them into the fridge until firm. 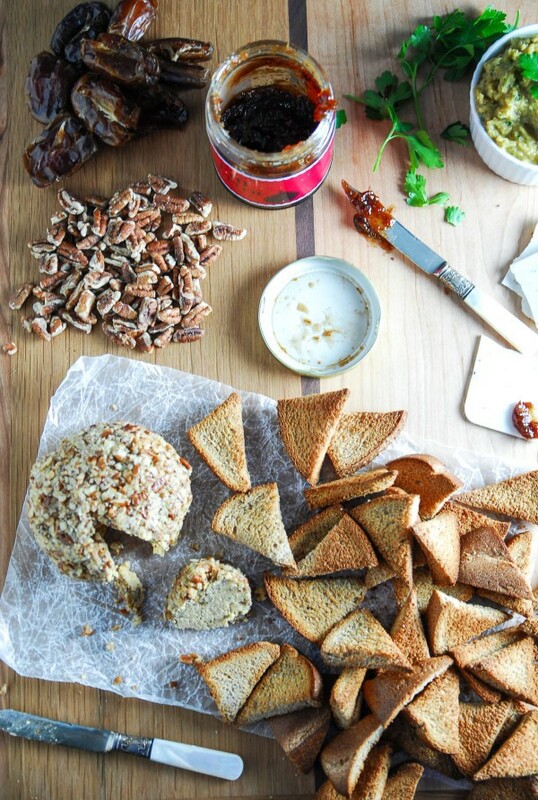 You can serve this holiday cheese ball with any number of sides, but I like toasted bread and crackers best. However, apple slices would pair well with this as well (the cheddar flavor goes nicely with tart apples, in particular). Place all the ingredients except for the pecans in the bowl of a food processor. Blend until smooth, adding water as needed. Scoop out and form into 2 balls and roll in the chopped pecans. Wrap each in plastic wrap and refrigerate until firm. I love foods that remind you of family!! As for strange foods, we always have a yule log on Christmas. My mom is the queen of yule logs. I’ve tried recreating it, but no one does it quite like her! I love foods that remind you of family!! As for strange foods, we always have a yule log on Christmas. My mom is the queen of yule logs. I’ve tried recreating it, but no one does it quite like she does! This looks delicious! A former employee of my family would sometimes give us a cheeseball around Christmastime, so I always crave cheeseballs around the holidays. It’s hard to find a good recipe that doesn’t use lots of faux cheese (which I can’t get locally), so I’m looking forward to trying yours! Whoa, this sounds delicious! I’m grateful that you created an oil-free vegan cheese ball! You are not alone in having a grandma whose specialties are super not vegan… ah, the good old days. Really cool that you are going through and veganizing them! I know, a lot of them are like ‘take 1 can of lard’ umm nooo thank you! Grandma Millie would think it’s just grand that you remember the cheeseball! Could you work on the chicken and noodles, too? I will do that next mom! Great recipe! I am going to try it out for my first homemade vegan cheese. I do have one question: How long will the “cheese ball” keep in the fridge? My husband’s surrogate mom always makes him a cheese-ball at Christmas, which he will polish off by himself, if he’s allowed to. It contains probably a pound of cream cheese! 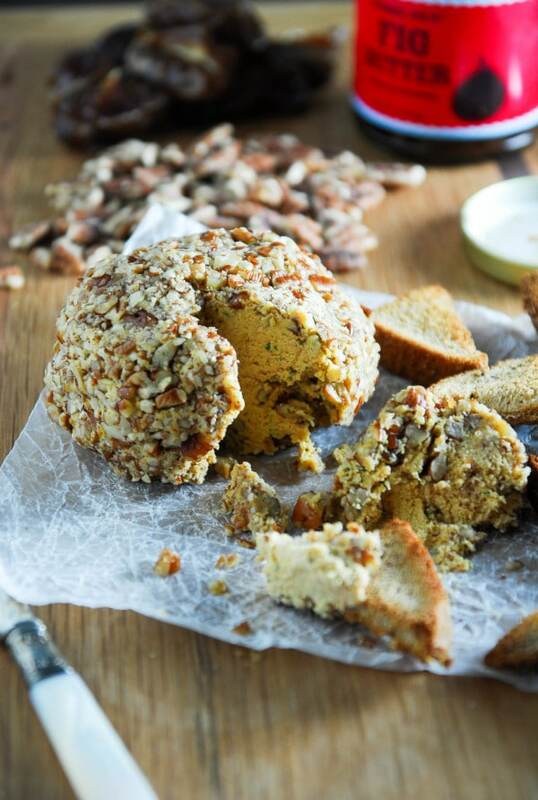 This Christmas, I will make this delicious looking dairy-free cheese ball and save his arteries the hassle. I love a good cheeseball tradition! It seems like everyone has them around Christmas, right? Our family has a Christmas eve tradition that is Polish and vegetarian…pierogis and mushroom soup. I used to look forward to it so much even as a kid because I always hated eating meat! Hi Chloe, the onion flavor isn’t super strong, but you can leave it out if you are concerned about it!